250W mogul base metal halide lamps have been an ignored set for a while, with only a few limited choices in the past. Recently there is a much larger variety of 250W mogul lamps that have become available and hence there is renewed interest in these lamps. In an excellent study Joe Burger conducted a detailed analysis of the PPFD output of these lamps. Details on this can be found at http://www.cnidarianreef.com/lamps.cfm. This set of articles (Part I and II) complements the work of Joe Burger by providing details on the spectral analysis of these lamps, along with the PPFD and CCT of these lamps. Nineteen 250W mogul lamps were tested, using 3 different ballasts as listed in the table 1. While testing the last set of lamps, I also received an electronic ballast from Reef Fanatic. Unfortunately, 14 of the lamps had already been returned, and I only had 5 lamps at hand to test with this ballast. Part I includes the data for the first 10 of the lamps listed (alphabetically) in Table 1. Part II will present the data for the remaining set of lamps along with a comparison of the different lamps. The magnetic ballast used was the Magnetek F-can ballast (ANSI-M58) and the HQI ballast used was PFO HQI ballast (ANSI M80). For each lamp/ballast combination listed, data was collected on the Spectrum, Photosynthetic Photon flux Density (PPFD) or PAR, as well as data on the power consumption of the ballasts. The power consumption was determined using a Vector True RMS power meter into which the ballast was plugged. The Vector power meter also records the voltage and current. The test setup used was the same as previous lamp tests , thus allowing for direct comparison of the results of these lamps with previously tested lamps [Ref. 1-11]. 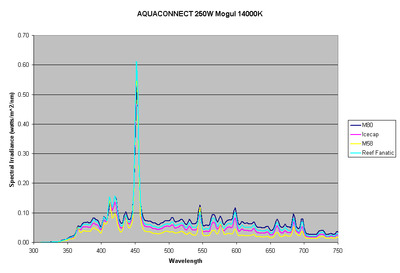 Figure 1: Spectral Plot of the 250W AB 10000K lamp on different ballasts. 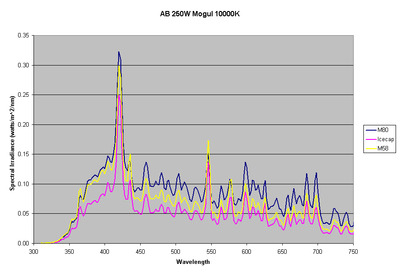 Figure 2: Spectral Plot Of The 250w Ab 10000k Lamp On Different Ballasts. Figure 3: Spectral Plot of the Blueline 10000K lamp on different ballasts. 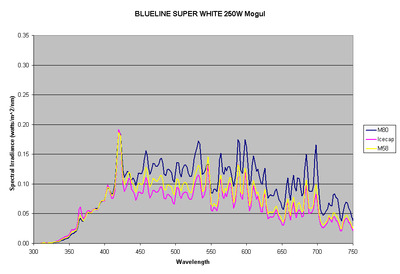 Figure 4: Spectral Plot of the Blueline Superwhite lamp on different ballasts. Figure 5: Spectral Plot of the Coralvue 10000K lamp on different ballasts. 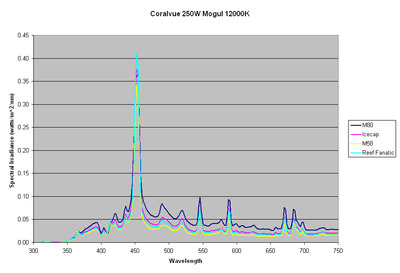 Figure 6: Spectral Plot of the Coralvue 12000K lamp on different ballasts. 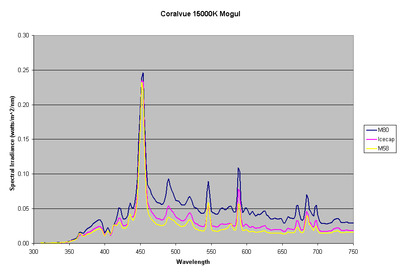 Figure 7: Spectral Plot of the Coralvue 15000K lamp on different ballasts. 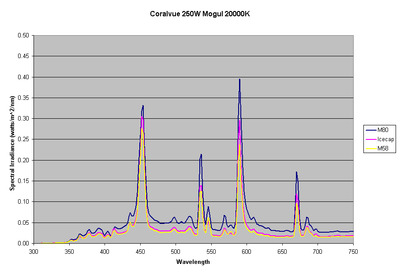 Figure 8: Spectral Plot of the Croalvue 20000K lamp on different ballasts. 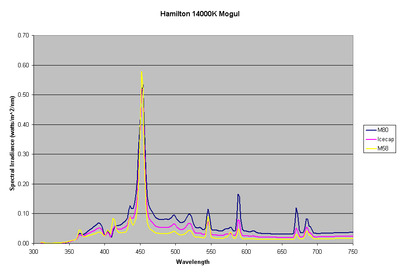 Figure 9: Spectral Plot of the Hamilton 14000K lamp on different ballasts. 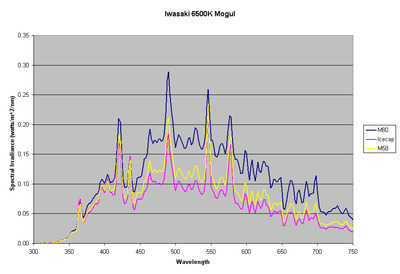 Figure 10: Spectral Plot of the Iwasaki 6500K lamp on different ballasts. Part II, will soon follow with data on the remaining lamps and comparison of the lamps. I would like to thank several people whose help made this study possible. Joe Burger for sending me all the lamps that he used in his tests. Patrick at PFO Lighting, Brian at HelloLights.com, Brad Shaw and Perry at Sunlight Supply, and Venki at Sun Aquatics. Finally, I would like to thank Dr. Paul Walker of Penn State University for the use of the spectroradiometer.